A new report from Future Market Insights has predicted that the global market for healthcare revenue cycle management software will reach $ 43.3 billion by the end of 2022. 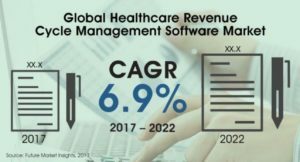 The global healthcare revenue cycle management software market is projected to soar at a compound annual growth rate of 6.9 percent during the 2017-2022 forecast period. The largest end-user of healthcare revenue cycle management software is expected to be in hospitals, but its use is projected to rise in clinics and laboratories as well. In fact, labs are estimated to have contributed a nearly one-fifth share of global revenues in 2017 and the end-use of healthcare revenue cycle management software in clinics is expected to net nearly $6.5 billion. Growing demand in several supporting areas, including services facilitating revenue cycle management for healthcare settings. In 2017, more than half of revenues taken in the global healthcare revenue cycle management software market will be for services. Healthcare-RCM services are pegged to gain traction in terms of adoption and inadequate numbers of trained staff. A rise in downcoding an RCM service are expected to fuel a boost in the buying of healthcare revenue cycle management as a service. Cloud-based products are proven to enhance resource acquisition, boost infrastructure reliability, and help consolidate operations. In terms of revenue cycle management software, cloud models increase flexibility and also enable transfer-ability between two or more end-users. The data showed that these attributes parlayed into major dollars, with nearly $ 27 billion in revenue expected to come through cloud-based healthcare revenue cycle management software on a global basis. OrboAccess anticipates meeting high demand in 2018 for electronification of payments. Have you and your organization locked down your RCM plans in advance of what will be a very, very challenging period?